Published on July 9, 2014 in Career Humour, Funny Pictures, Mistakes To Avoid and Professional Development Tips. 0 Comments Tags: Invisalign, Sharts Without Sharp Teeth, Smiling Sharks. 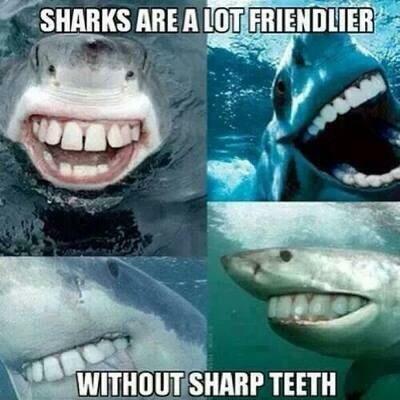 If sharks can be made to look less menacing without sharp teeth, what does that mean for us humans? As I’ve blogged before, you can’t afford to be ugly, especially when there are cosmetic dentists like Dr Cary Fraser who can provide dental solutions like Invisalign!